FILE - Local residents pay their respects to the victims of the attack at the Holey Artisan Bakery at a stadium in Dhaka, Bangladesh, July 4, 2016. The United Nations says Southeast Asia needs to put in place a comprehensive regional plan to combat a rising threat of violent extremism as Asian fighters return home from Iraq and Syria. The call by the UN’s Office of Drugs and Crime (UNODC) is set amid fears of growing cooperation between Islamist extremist groups, al-Qaida and the so-called Islamic State (IS) members in the region. Jeremy Douglas, the UNODC Asia regional representative, said while Southeast Asian countries have improved collaboration and intelligence sharing, measures are ad hoc and inconsistent, especially in dealing with fighters returning from the Middle East. “The region itself doesn’t have a strategy to deal with [foreign fighters]. There’s some strategies at a national level to an extent but they are very inconsistent across the region, and the region itself doesn’t have a strategy to deal with this phenomenon,” Douglas told VOA. He said it was important for ASEAN to develop a regional prevention of violent extremism plan that is subsequently tailored for each country. 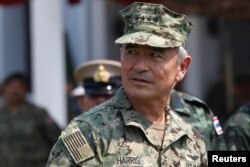 The UNODC’s call comes as the Commander of the U.S. Pacific Command, Admiral Harry Harris, added his concerns that the Asia Pacific faced a growing risk of attacks by IS group fighters returning to their home countries. “It’s not a theory. It’s real,” Harris told a recent conference in New Delhi. “In the past year alone ISIL [IS] had made its murderous intentions clear in places like Bangladesh, Indonesia, the Philippines, and the United States,” he said. FILE - U.S. Admiral Harry Harris, commander of the Pacific Command attends the opening ceremony of the Asia-Pacific multilateral military exercise known as Cobra Gold, at Sattahip Royal Thai Marine Corps Base in Chonburi, Thailand, Feb. 14, 2017. Analysts say estimates of Asian fighters in the Middle East are around 1,000. Authorities have succeeded in preventing others from traveling, bound for Syria and Iraq. But often fighters will journey to several countries before traveling to Turkey to avoid detection. In the past year the UNODC says Indonesian arrests and deaths of terrorist suspects “more than doubled” to 170. But signs of the threat are still there. In January 2016, an attack in Jakarta was said to be the first IS assault with a suicide bombing that led to the deaths of four attackers and four civilians. FILE - Indonesian police stand guard at the site of this week's militant attack in central Jakarta, Indonesia, Jan. 16, 2016. In July, an attack on a restaurant in Bangladesh by IS left more than 20 people dead. 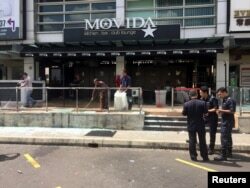 Also in July a grenade attack at a nightspot in Kuala Lumpur’s Puchong district left eight people injured amid warnings of further attacks. FILE - The Movida bar is pictured after a grenade attack in Puchong, on the outskirts of Kuala Lumpur, Malaysia, June 28, 2016. While some reports blamed the attacks on local gangsters, Malaysian authorities arrested 15 people, including two policemen accused of providing support to IS elements. Authorities claimed the attack was carried out on orders of Muhammad Wanndy Mohamed Jedi, a Malaysian Islamic State fighter in Syria. The report said specific attention is needed to focus on the Philippine region of Mindanao, especially among pro-IS groups with links elsewhere in the region. These groups included the Basilan-based faction of the Abu Sayyaf Group (ASG); Ansarul Khilafa Philippines (AKP); the Maute group in Lanar del Sur and Bangsamoro Islamic Freedom Fighters (BIFF). 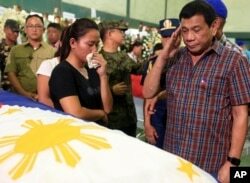 FILE - Philippine President Rodrigo Duterte salutes flag-draped coffins of 15 soldiers killed in Monday's gun battle with Muslim Abu Sayyaf militants during his visit to Western Mindanao Command in Zamboanga city, in southern Philippines. Thitinan Pongsudhirak, a political scientist at Chulalongkorn University in Thailand, said military defeats in Syria and Iraq will lead IS fighters from Southeast Asia to return to the region. “They will start to conduct their operations elsewhere. This will be home grown self-help, lone wolf, — you’ll see more of that. At the same time the organized fighters will return to their countries, including Southeast Asia,” Thitinan told VOA. “This means that South East Asia will have to be ready and brace themselves for potential terrorist violence looking forward,” he said. But Thitinan said Southeast Asia needs to draw on past experience in dealing with the threat posed by the Islamist terror group Jemaah Islamiyah (JI) over a decade ago. “Overall, ASEAN has dealt with this before — with the Jemaah Isalmiyah and it was largely successful. Indonesia in particular. But overall the handling of the terrorist violence has been more individual country based — each country for itself rather than ASEAN wide efforts,” he said. Southeast Asian nations were galvanized after JI’s deadly attacks, including 2002 bomb attacks on Indonesia’s Bali island, which killed more than 200. These were followed by JI linked bombings in 2003 at the JW Marriott Hotel in Jakarta and the 2004 Australian Embassy bombing, also in the Indonesian capital. “[But] this round will be interesting because ASEAN is more divided now,” said Thitinan, with countries faced with new leaderships and differing interests. Human rights lawyer and author Banjamin Zawacki agrees that cross regional cooperation may be a challenge. “It is going to be difficult for Southeast Asian countries to come up with a collective policy to which all 10 countries [of ASEAN] are going to agree, because ISIS (IS) is so new,” Zawacki said.